By LUDWIG VON KOOPA - Some recent developments with these two companies, both dedicated to race. Which one turns out to be the least bad? I would like to disclose a diversity report with KoopaTV: As of this Monday, KoopaTV's only employees are straight, male, very privileged (positions within royalty, you see), and Koopas. Apparently, that sort of "diversity report" is a very troubling thing, at least in the eyes of the infamous Jesse Jackson. Who cares what he has to say? Well, apparently Microsoft does. "Rev. Jesse Jackson, who was given the stage [at Microsoft's annual shareholder meeting] to read remarks asking Microsoft to do a better job hiring minorities. [...] And [Jackson's] Rainbow coalition has been successful at getting many big tech companies to release diversity data, Microsoft included." If you need me to explain why affirmative action is a terrible idea and that Jesse Jackson is out to make companies less competitive in the name of "civil rights" and "social justice", sure, I'll go ahead and do that. It is bigotry to take a less qualified candidate over a more qualified candidate just because of an irrelevant-to-the-job trait they were born with (such as being black), or went out of their way to acquire (such as what transsexuals do. And this isn't just a characteristically tangent knock on transsexuals — it is actually a serious problem raging around America and the world about what to do with these people in bathrooms or Boy Scouts or historically women's colleges. Will people change their gender just to take advantage of corporate diversity policies?). If the black dude isn't as qualified as the white guy and the white guy is qualified and you need a new hire now, why not hire the white guy? I wrote a whole, very memorable article on the danger of these egalitarian approaches that addresses affirmative action in the context of the Super Smash Bros. roster. Really, do the programming fields need "diversity" to do their job? Does programming Microsoft Word 20xx or Kinect Sports become any easier if the team looks like a rainbow put through a greyscale filter? NOW THEN, on the opposite side of the spectrum, we got Sony. I've mentioned earlier that Sony has had troubles being hacked by North Korea recently, and those troubles continue with leaked e-mails between Sony executives on... President Barack Hussein Obama? "Hollywood film producer Scott Rudin and Sony Pictures Chair Amy Pascal have been further embarrassed by leaked emails released as a result of the Sony hack, this time mocking President Barack Obama in a set of racist email exchanges. On the eve of a fundraising breakfast being attended by the President at the home of DreamWorks CEO Jeffrey Katzenberg, Pascal and Rudin went over things she could discuss with Obama while at the event in October 2013." Wait. October 2013? That was the same month that Obama name-dropped the PlayStation 4! And it happened that the fundraiser happened earlier in the month than that Obama quote. I think we very well know what those Sony people ended up talking to Obama about: Not Obama's movie preferences, but to give him lines featuring Sony's PlayStation 4! Which had not actually released yet. 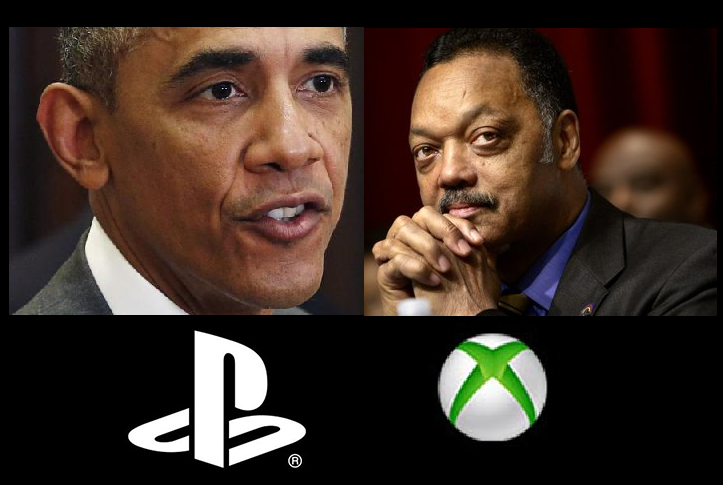 Reminder: Obama gave an endorsement to the Xbox One earlier in that month (which was one day after the fundraiser the Sony executive attended). What can we conclude? October 6: Sony executives exchanged racist e-mails to one another about Obama over what to say at Obama fundraiser. October 7: Obama fundraiser occurs. Sony executive that attended it must have said something stupid to Obama, influenced from the day before. October 8: In speech about the government shutting down, Obama endorses Sony's competitor, the Microsoft Xbox One. Later in October: Sony must have apologized to Obama, and Obama mentioned the PlayStation 4 in his next speech as a sign of good-will. After all, how mad can you be at a major donor? You and I both know which console manufacturer is excluded from all of this like they do not exist, of course. They aren't "in" with the Obama crowd. Or the Jesse Jackson crowd. And that console manufacturer is all the better for it. So which company is worse? The arrogant one with racist, cronyist executives... Or the one that is now going to actively try to ruin the employment dreams of thousands of people just because they were born the "wrong" skin colour (white) and the "wrong" gender (male)? Discuss that, if you want. I don't have an answer. It turns out that Sony is actively competing for being worse than Microsoft. Right after this article was published yesterday, it was revealed that Amy Pascal, the Sony executive who attended the Obama fundraiser, called both Jesse Jackson AND Al Sharpton. To apologize and make amends to the black community, of course. And to liberals like her, Jesse Jackson and Al Sharpton are the leaders and representatives of blacks in America. I know a lot of black people would like to disagree with that characterization! So while Microsoft only got one of them, it looks like Sony got BOTH prominent race-baiters. Isn't it funny how actual black people refused Jesse Jackson's presence and booed him out of Ferguson, Missouri, but all of these white guilters picked him up as leftovers? It goes to show that they are not willing to do the actual research into the people who truly represent the black community. It's a strange thing that Al Sharpton and Jesse Jackson have a sort of duopoly over the racial grievance industry. It feels weird saying this, but maybe there should be more competitors in it? I guess Sony is worse than Microsoft now. If you want to make amends for your private racist comments, you don't go to two of the most racist people in America (one more than Microsoft did) and acknowledge them as representatives of all black people! KoopaTV has low enough standards for its staff that it is surely open to anyone of any race, gender, whatever! So go ahead and apply for a job! That unnamed company at the end IS "in" with the President Bush crowd, apparently. Now that Al Sharpton is involved, if you need an interactive way to see how he's evil, play Trayvon Tyson's Punch-Out!! right here on KoopaTV! How evil is it on Sony's part that they are complicit in shutting down free speech as well? "You and I both know which console manufacturer is excluded from all of this like they do not exist, of course. They aren't "in" with the Obama crowd." I hope it stays that way. I prefer the Nintendo to stay clean and out of politics and just make great games. Yeah, Nintendo is the last one standing! Leave the politicking to us, Nintendo!